Lady J is a Philadelphia based Cosplayer and Forensic Scientist. As a forensic scientist Lady J does her part to keep the streets safe by day and on her off time continues to express the importance of truth, justice and love for humanity through cosplay. Lady J believes cosplay is so important because it allows people to share experiences, express their creative/artistic sides, is an important outlet that allows us to becomes our favorite heroes/villains and share the positive effect these stories of heroism can have on an individual. Lady J not only cosplay’s for those reasons but to spread Cospositivity: acceptance to all shapes, sizes, colors, genders, skill level etc. and to use it to help spread the word and fundraise for charities (such as our real life heroes’ vets, officers, firefighters, medical research such as cancer, diabetes and children’s charities). This love for charity work has developed into a charity cosplay group called the Philadelphia Avengers which Lady J is a founding member. The Philadelphia Avengers mission is to help spread joy and positivity through cosplay and charity. We have helped charities such as Toys for Tots, JDRF diabetes Run, Light the Night Walk for Leukemia just to name a few. In 2015 Lady J presented her first panel Beginning to Cosplay and Cospositivity at Wizard World Comic Con in Philadelphia and has continued to spread the message ever since. She has also presented at Dover Comic Con, Rhode Island Comic Con, Great Philadelphia Comic Con and continues her message on social media and beyond because Cospositivity is so important to her. 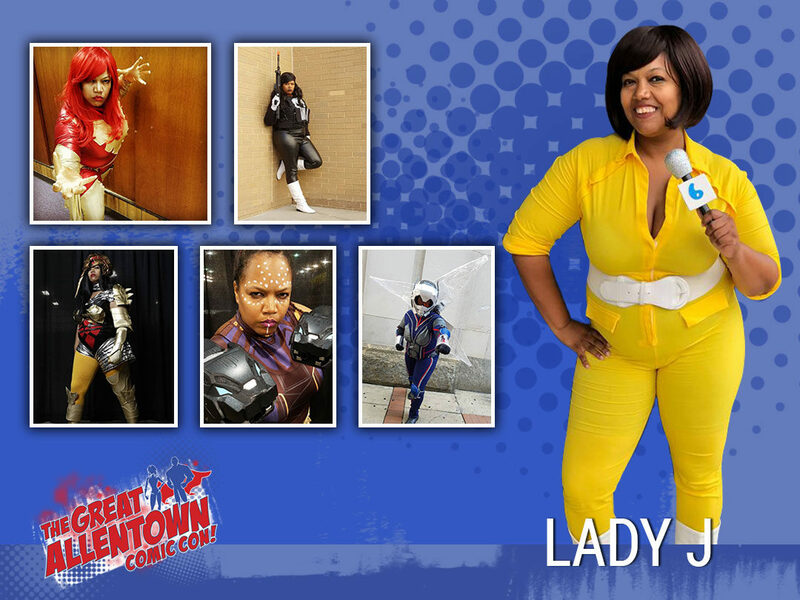 Lady J has been a guest at Dover Comic Con, OC Con and Great Philadelphia Comic Con. She has also appeared at Lehigh Valley Comic Con, Awesome Con and Jersey Shore Comic book shows with the Philadelphia Avengers and continues to travel the circuit as both attendee and guest. Lady J is also a member of the Philadelphia Power Rangers where she is known as Philly Yellow. You can also see Lady J in print in the May 2016 issue of Cosplayzine magazine. Lady J is also the owner of Lady J Nerdy Shop, whose mission statement is to bring geeky goodness to everyone at affordable prices.